We are thrilled with Amazon’s offspring. He has been working in herds in Nebraska, Kansas, Missouri, and Texas. This bull has a lot of capacity and slicks up early in the spring. 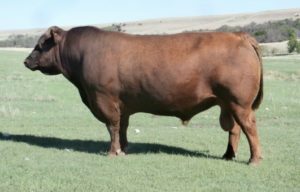 He is a calving ease bull (CED 13, BW -3.2) with tremendous fleshing ability. He is co-owned with Jim Madsen from Russell, KS.